I’ve selected some of my favorite brands to feature in this collection of recipes, and added some fall flavors and custom cocktail syrups to spice things up. Please don’t feel intimidated by the DIY ingredients! These three syrups are all incredibly quick and easy to make. I will be compiling a general how-to guide to syrup making soon, but the gist of most recipes, including the ones below is: add equal parts water, sugar and flavor (fruit, vegetable, etc.) to a saucepan and simmer for about five minutes. Let cool and strain. That’s about it. Nothing to be afraid of here. Just delicious, autumnal flavors to help you live your best life when you’re not downing pumpkin spice lattes. Fill a mini pumpkin with seeds removed (or a tall glass) halfway with ice. Add all ingredients and stir well to chill. Add more ice and garnish with a slice of pumpkin waffle, if you’re feeling fancy. Preheat to 400 degrees F. Line a large baking sheet with foil. Wash pie pumpkin and cut in half. Scoop out the seeds and stringy bits and cut each half into 3 or 4 wedges. Brush the flesh with olive oil and season with salt and pepper. Roast for 40 minutes. Let cool, then remove the skin. Add about 1 cup of pumpkin flesh, .5 cup of carrot juice, and a pinch of ginger powder to a blender and blend on high until smooth. Next up is a little sipper I threw together one night when I was looking for something herbal and interesting that would work with an apple syrup. I had created a few different apple based cocktail syrups but the apple cinnamon combined with rum and green Chartreuse was a solid WIN. A cocktail with this much alcohol shouldn’t be quite so easy to throw back, so enjoy with caution. This is best enjoyed sitting by a fire on a rainy November day. Combine ½ cup sugar with ½ cup water, 1 large washed and chopped granny smith apple, and 1 cinnamon stick. Heat over medium heat until boiling, then reduce heat to low and simmer for about 10 minutes, or until the apple just begins to break down. Remove from heat and allow the syrup to cool, then strain into a clean glass jar and store in the refrigerator. Add all ingredients to a cocktail shaker with ice and shake until chilled. Strain into a chilled coupe and garnish with an apple rose. Pro tip: apple (and other fruit and vegetable) roses are super easy to make if you soften the fruit slices by quickly microwaving them (30 seconds or less). Let them cool enough to handle and then roll into a rose. Secure with a cocktail pick. Perhaps my favorite Negroni riff to date, this little number is apple forward and pleasingly bitter. Significantly less bracing than a traditional Negroni, this variation has just enough Suze to wake up your tastebuds. If you prefer a more bitter flavor, up the Suze to .75 oz and decrease the apple cinnamon syrup to .25 oz. Add all ingredients to a mixing glass with plenty of ice and stir until chilled. Strain into a rocks glass filled with ice (or one large clear Wintersmith cube), express a lemon peel, and garnish with an apple fan. Heat milk in a small saucepan. Once heated, stir in Bouvery CV and pour into a large mug. Top with freshly made lavender whipped cream*, organic cacao powder, and edible flowers, if desired. Create a lavender simple syrup by heating ½ cup of sugar with ½ cup of water and ½ cup of dried organic lavender buds. Bring mixture to a boil, reduce heat and simmer for 5 minutes. Remove from heat, allow to cool, and then strain into a clean glass jar for storage in the refrigerator. Chill for at least 2 hours. To make the whipped cream, add 1 cup of chilled heavy cream and 1 oz of chilled lavender syrup to a medium sized stainless steel mixing bowl and mix on high for about 1-2 minutes or until medium peaks begin to form. Don’t over mix - it will become lavender butter! For best results, chill your bowl and metal whisks ahead of time so that the whipped cream is very cold when mixed. It will come together more quickly and be more a bit more firm. I love hard seltzer in the summertime - there’s nothing lighter or more refreshing to sip on poolside. Even if you’re like me and that pool is of the pink plastic variety with a naked toddler splashing in it. I enjoy tall, refreshing cocktails year round, so hard seltzer isn’t just a summertime ingredient for me. I love the unusual flavors PRESS seltzer makes, and their Grapefruit & Cardamom inspired me to make an autumnal Paloma with a fig & cardamom syrup. This pale pink beauty is the perfect cocktail to help ease that seasonal transition from poolside to fireside. Combine ½ cup sugar with ½ cup water, 3 green cardamom pods, and about 8 washed and chopped fresh black mission figs. Heat over medium heat until boiling, then reduce heat to low and simmer for about 10 minutes, or until the figs begin to break down. Allow the syrup to cool and then strain into a clean glass jar and store in the refrigerator. Note: if you remove it from the heat as soon as the figs begin to break down, it will be a bit easier to strain. If you would like a particle-free syrup, strain through cheesecloth. Add first three ingredients to a cocktail shaker with ice and shake until chilled. Strain into a wine glass filled with ice (or two large clear ice spheres, thanks to Wintersmith), and top with PRESS Grapefruit & Cardamom. Stir gently and garnish with a fig and seasonal edible flower (goldenrod pictured). What could be better than a perfectly chilled Manhattan to warm you up on a cool October evening? I used both rye and applejack in this autumnal Manhattan variation, with a dash of Free Pour Jenny’s fabulous Solstice bitters for a hint of spice. These handcrafted bitters from the Yukon Territory in Northern Canada are made with a delicious blend of spices and bittering agents that includes cranberry, cinnamon, clove, and star anise. Add all ingredients to a mixing glass with plenty of ice and stir until chilled. 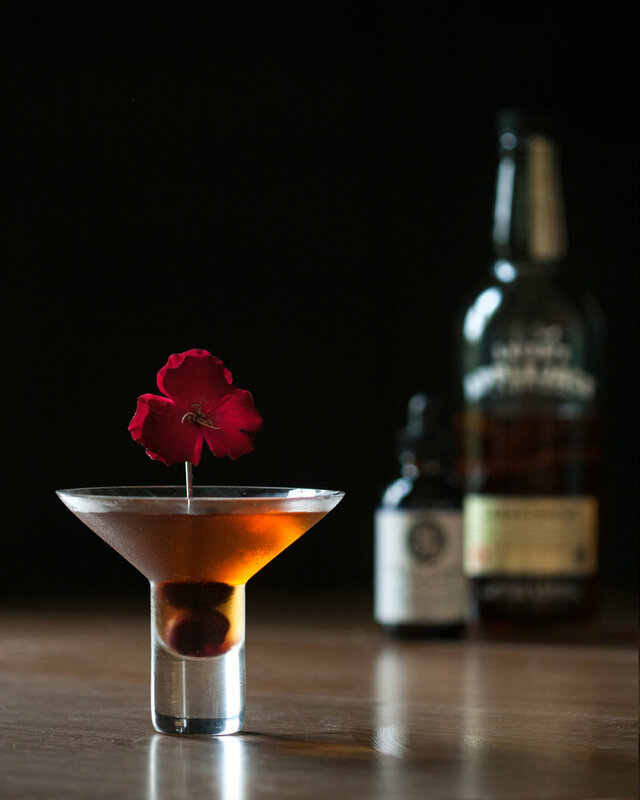 Strain into a chilled martini glass and garnish with a cherry and an edible flower, if desired. My newest booze discovery is Catan Pisco! This woman-owned brand was founded by Chilean-American Catalina Gaete and just launched in Chicago this past summer with a mission of bringing pisco to a wider audience in the US. I love that Catan’s vineyard in Ovalle, Chile is fair trade and organic, and you can really taste the quality in this fruit-forward, handcrafted spirit. It’s a shame that pisco doesn’t get more love from the craft cocktail community. It’s really wonderful to mix with and works well in a variety of cocktails, from botanical-based to spirit forward. Help spread the good word and welcome fall with this Pear & Ginger Pisco Sour! Muddle pear in a shaker with lime juice. Add remaining ingredients and ice and shake until chilled. 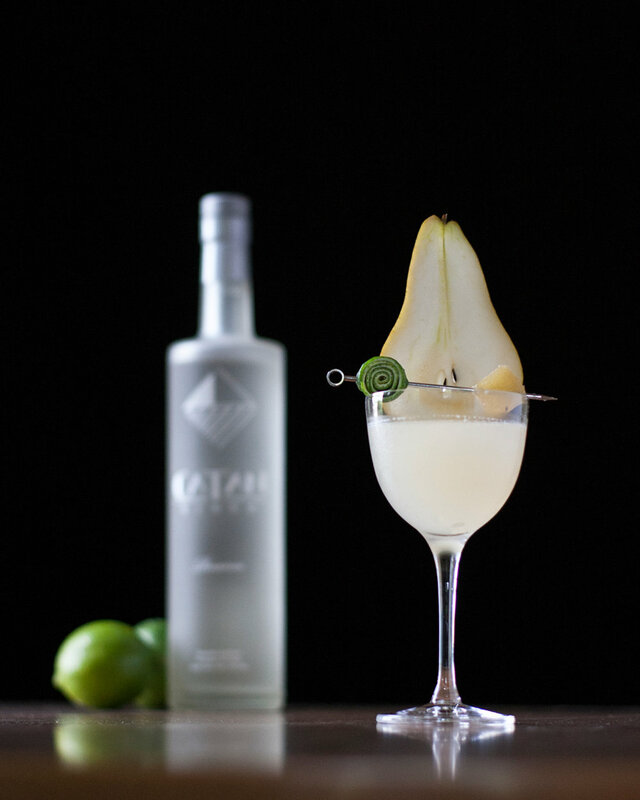 Strain into a chilled cocktail glass and garnish with a pear slice, lime rosette and candied ginger. Combine ½ cup of water, ¼ cup of wildflower honey, ¼ cup white sugar, and two pieces of fresh ginger (each about the size of your thumb) to a small saucepan and heat until boiling. Reduce heat and simmer for 5 minutes, then remove from heat and allow to cool. Once cooled, strain into a clean glass jar for storage in the refrigerator. No list of cocktails would be complete for me without a gin-based one! I use gin A LOT and really enjoy trying new varieties, from tried and true London Drys to new American styles - I love it all. I’ve been playing with recipes involving apple, lemon, and rose for a little while now and I think I’ve finally created one that’s just right. This lightly spiced apple cocktail features the bright, sweet flavor of unfiltered honeycrisp apple juice to celebrate some of fall’s best fruit. Add all ingredients to a cocktail shaker with ice and shake until chilled. Strain into a chilled cocktail glass and garnish with a slice of apple and an edible flower, if desired. Disclosure: This post contains sponsored content. All opinions and content are my own.